My leadership is influenced by my Christian faith. The ‘how’ of my leadership has to reflect the ‘who’ I live for, and that is Jesus. If I lived for myself and my own ambition then my leadership would reflect that. This is why prayer has become such a non-negotiable in my life as a leader. Prayer keeps me humble. I realise this may almost be contradictory as a statement but asking God for help reminds me that without Him working in me and through me, I am limited. It keeps my leadership from becoming all about me. Prayer is the one thing I can do for all of those on my team. I cannot always meet all their specific needs but I can pray to my God who can. Prayer invites God into all that I am doing. To ask for wisdom, insight, clarity, ideas. It creates space for me to hear Gods voice and that is just an essential for any Christian leader. Jesus prayed. Enough said. He spent time with His heaven Father to know what He was saying and was asking Him to do. Prayer relieves stress. The very fact we Jesus encourages us to cast our cares on Him is so freeing. In doing this we will learn how to walk and work with Jesus and His wonderful, unforced rhythms of grace. Prayer exercises my faith. There should never be a time, whether a leader or not, when we are not believing in faith for something. Pray for that project, the event, the people, the outcome, for God to move, to see lives transformed. Prayer puts my faith in God to work when I ask Him to do something that I cannot make happen myself. 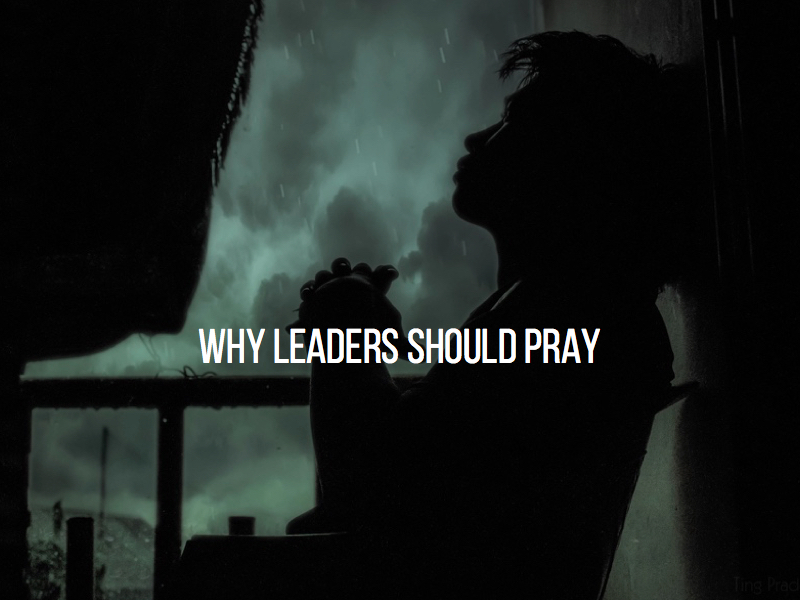 What other reasons would you give for why prayer as a leader is important? Leadership is not really about being in charge, there is way more to it than that. If you are having to wave around your ‘title‘ or keep reminding people that ‘you should be allowed to do what you want because you are the boss’ thenI want to suggest your leadership may be in need of a review. The best leaders are the leaders who have a presence. Not in a ‘big brother’, or ‘the boss is watching’ kind of way. It comes through in how people behave, the culture, the communication, the atmosphere. It is hard to define, you could say it’s more ‘felt than telt’. It’s not about being ‘the boss’ either, ‘telling people’ or even about giving directions all the time on how things ‘must’ be done. It’s not about rocking up and just complaining, correcting and finding fault. You will have a presence but it will not be a healthy one. Anyone can do that. 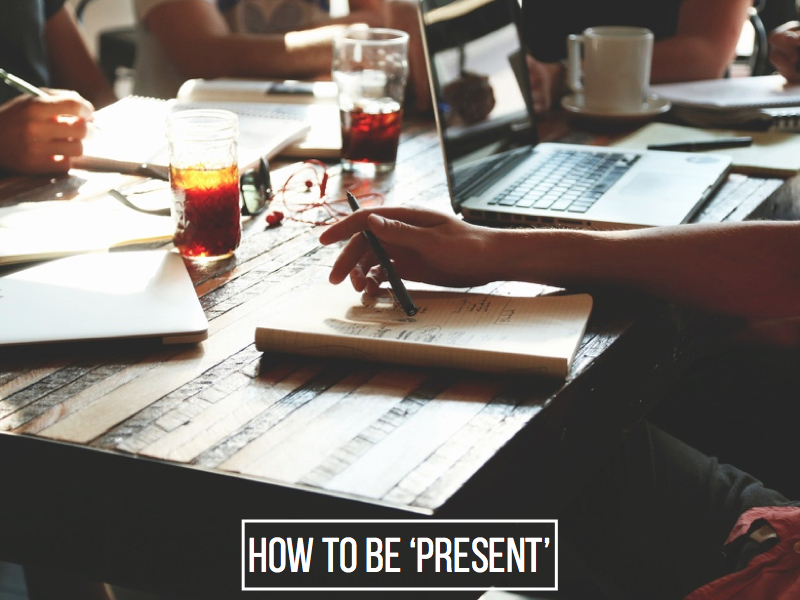 Instead, it’s about how you show up, how you make others feel, and how effectively you communicate both verbally and non-verbally. It’s lending a hand. It’s giving a word of encouragement. It’s about seeing your team and acknowledging the effort. It’s about asking the right questions, hearing them and seeing what they need to make them even more effective. Demonstrate a confidence in your team. Think about it, they are not trying to get it wrong. No one wants to crash. A little bit of belief makes a massive difference. Focus on the wins, give them the thumbs up, be part of the ‘we can do it’ mentality. Confidence breeds confidence. Praise publicly and criticise in private. Too easy to find fault and go straight what’s not working or not done. I have made that mistake and it was an uncomfortable lesson to learn. When things are not quite right, they usually already know it. Save the comments and review for a more appropriate time. Watch the non-verbals too. The face struggles to lie. Whether it be disapproval, the rolling of the eyes, or just not seeing people doing things well, the non-verbals are often more powerful than the words we speak. Smile more. Help them out if needed. Talk with them rather than to them. Ask questions. Learn about their world. Be genuinely interested. As a leader we know what we want and we are trying to make sure others understand that. It can seem counter-intuitive to slow things down but by being there for the team, serving them, getting involved in their lives and knowing what’s going on will eventually see a lift in productivity and progress happens. What would you add to this thought? Do you agree or disagree? What’s your experience of a leader with great ‘presence’? Here are 5 quick things I have learned when it comes to the thinking aspect of being a leader. I recognise this may not come easy to everyone but I have discovered the importance of the thinking the process, and how much it is an essential aspect of leadership which every leader must embrace. To not think things through could be seen as ignorant, maybe lazy, perhaps a little dangerous. Create Space. For me I have to be deliberate and block out time, even to the point of putting it in the diary as an appointment sometimes. Learn they way which works for you. I like a clear desk and a pile of clean sheets of paper and then I am ready to go on the journey of thinking, noting down thoughts, questions, ideas which I can come back to later. To an observer it may seem like a curious process but I have learned over the years what works for me. Honest Reflection. We have to be willing to ask the more difficult questions. It’s not about what I think is right for me but rather what is right for what or who I am leading, to which there is a subtle difference. Time with God. I can have great thoughts but what I really want are Gods thoughts. All of the above are only as useful as it is to make time to hear from God, what does He think, how is He wanting to lead and direct me. One of my favourite scriptures is from Proverbs 16:9 ‘A man’s heart plans his way, But the Lord directs his steps’. There are benefits to thinking things through properly, none so more powerful than just not looking like you haven’t really thought about it. People are not always keen to follow a leader who doesn’t seem to care or give them confidence of any thought or preparation. Thinking things through builds trust. It creates a greater sense of team, if we involve them too in the thinking process. It shares responsibility too. It reveals how much you actually care about who or what it is you are leading. Why not take some time this week and create your own thinking plan. 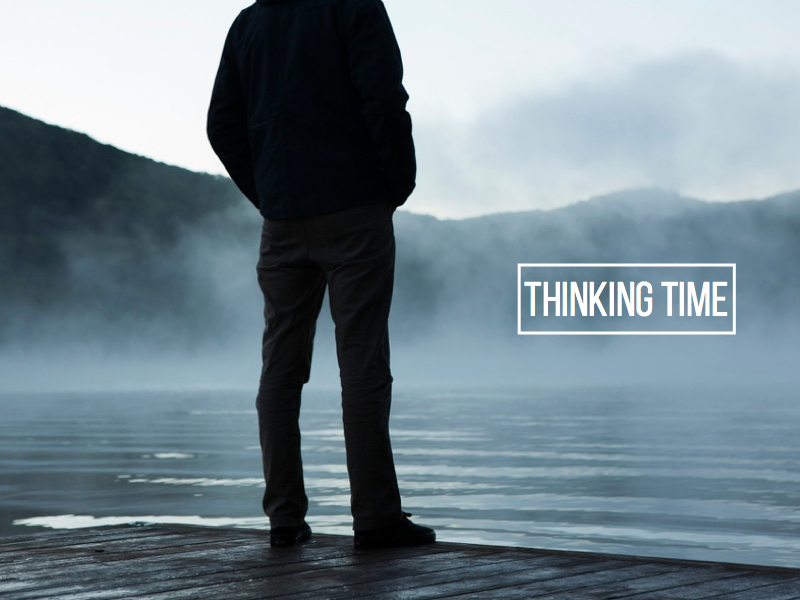 Think about how you will make time to think. I guarantee it will be worth it, for you and for your teams. Any other suggestions in regard to this idea of leadership and thinking? Focus is important. The ability to be focused and maintain our focus could be considered one of those distinguishing features of a leader. Some just seem to have it. Some need to work a little harder on developing it, the focus toward a purpose or the achievement of something in particular. It’s not about being bossy but instead is about bringing a sense of clarity, of clear vision, of knowing what is needed at a certain time. The opposite is therefore true. 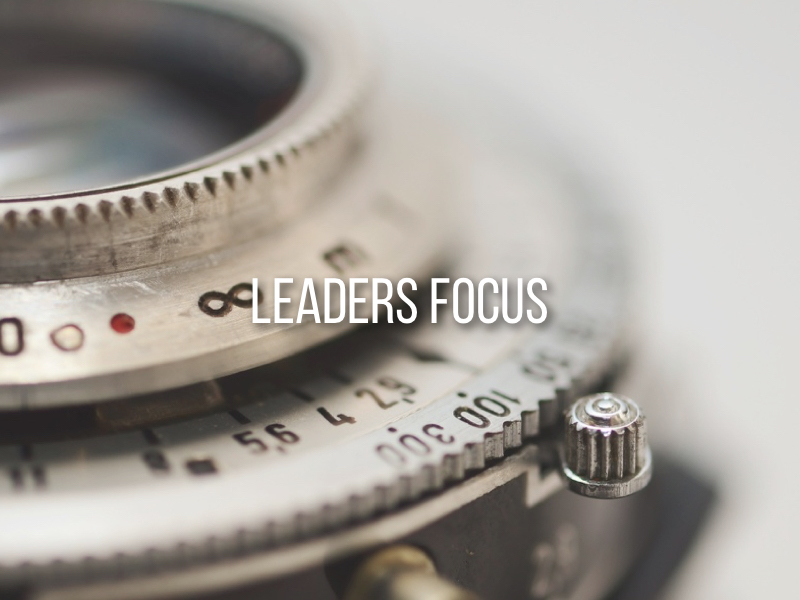 A lack of focus can create unease, an awareness that the leader doesn’t seem to know what to do or where to go. Teams are looking to be led which means as the leader there has to be a willingness to spend time giving focus to the right things at the right time. In what we SEE. What our eyes see. What we pay attention to. What we look at. Yes, it is about the detail, to ensure what needs to be done is being done but it’s also about the people working on our behalf. When you really see your team you see their needs. and great leaders serve the needs of their team. Focus on what you see and respond. What we HEAR. An ability to listen. To know what’s being said. The good and the bad, with a willingness to ask the difficult questions. Leadership is about hearing, not just about being doing all the talking because we are in charge. Great listeners learn what will influence the culture in a positive way. Think about what Pastor Andy Stanley says ‘Leaders who don’t listen will eventually be surrounded by people who have nothing to say’. Focus on what you hear and respond. What we FEEL. Getting to the heart of the matter. Developing the gifts within us. Discernment. Wisdom. Intuition. Instinct. Gut. Being led by the Holy Spirit. Too many times I have ‘felt’ that I should do or say something to a person, not acted and then heard later about an outcome which, who knows, may not have happened if I had been obedient to that feeling. Focus on what you feel and respond. What do you think about this simple but powerful thought? It was 1996 when I first thought about leadership development. A throw away question in a youth leaders meeting about how to invest in a bunch of younger leaders triggered something in me. Since then I have read myriads of books, attended umpteen conferences and listened to a boat load of messages and podcasts too. Everyone has an opinion about leadership so I know what I am about to write will not be considered original or particularly controversial. Building is hard work but rewarding. Building is about the future and not just about today. Building changes the landscape and creates the culture within it. 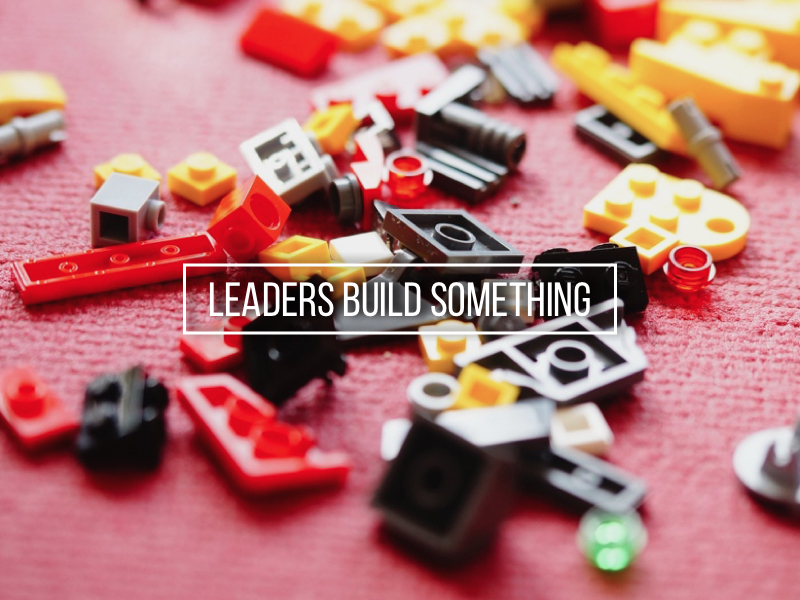 BE A LEADER WHO BUILDS. And spend your energy on building the right things. Build those things that have an eternal value and an eternal mark on them. 1. BUILD CHARACTER. We can build a great life but it can just become a monument to a failed individual if we don’t build the character to go with the talent and opportunity God brings our way. Character keeps us and protects us. 2. BUILD OTHERS. Leaders serve others. We don’t build ourselves for ourselves. We build ourselves so we can pass on what we learn and experience to others following in our footsteps or working alongside us. 4. BUILD SLOWLY. Good builders understand it takes time for what they are building. Build in a hurry and you may build for failure. Instead, decide to become a master build, commit to the long haul and build a life of substance, one others would want to follow. 5. BUILD EXCELLENTLY. Build well. Give it your best attention. Care. Make it count. Jesus spoke about how a good builder considers the cost, lays a proper foundation, and only starts what they know can be finished. Lets be great Christian leaders who are willing to give everything to build the right kind of life for Jesus. One thing is certain, building such a life is the most rewarding kind of life. Let me know what you think about this idea of being a builder? What are the challenges to developing such an attitude towards life? Be willing to listen to other peoples opinions. It can make for uncomfortable reading but by involving others you have the potential to take something which is good and make it so much better. This is why I love that we are doing a ‘pilot run’ of the Growth Track, for such a reason and some of the comments are great. Be willing to admit when it wasn’t quite right. All the planning in the world doesn’t make up for actually going through something with a bunch of people. The feedback just reminded me of things I had meant to say, they were in my notes but I just forgot. Be willing to work hard at making necessary changes. Some of these are on me to do and then getting others to help with the rest. It’s no good listening to comments to just ignore them. Leaders execute stuff, they get stuff done and work hard to make things better. Team is always best. This for me is an example of Team Xcel at it’s very best, collaborating on what we all agree will be a great success and help many people in their journey with God. Team can also help in making the suggestions happen too. It’s all about helping people move on one step with God. It’s why I am excited about the Growth Track and what it can mean for people and their connection with God, with others, with their purpose and with the church family. What have your leadership reminders been today? To lead well in life is to be a person who lives with an attitude on not making everything about ourselves. To stop making ‘me’ the centre of everything. People who lead well in life are the ones who have made the decision to not be led by emotions, by opinion or by circumstances. Instead they are led by values, convictions and character. Phrases that could be thought of as ‘below the line’ are significant by their absence in a great leaders life. I’m not happy with the decisions being made. I don’t like the way I’m being treated. I can’t work with them. I haven’t been thanked for ages. Leading well in life is about more than position, it’s about me as a person. Yes, I need to demonstrate some competencies but how I demonstrate them is often of greater importance. Let’s be leaders who think carefully how we speak, think and feel and work at removing any below the line attitudes which can make everything about us. Just some thoughts – tell me what you think. To lead well in life is to not get stuck being someone pointing out problems and becoming someone who chooses to become a part of the solution. If you want something, then instead of pointing to others and asking them to ‘sort it’, why not start and try to give it yourself. Need more friends, then be more friendly. Want people to listen to you, then begin by listening to others. Feeling you’re being overlooked, then start noticing people. Never receive any thanks, then give some. Want to be more connected, then be the one who makes connection. Aspire to be a leader, then show a greater willingness to be led. Believing for a great future, start believing in a great now.